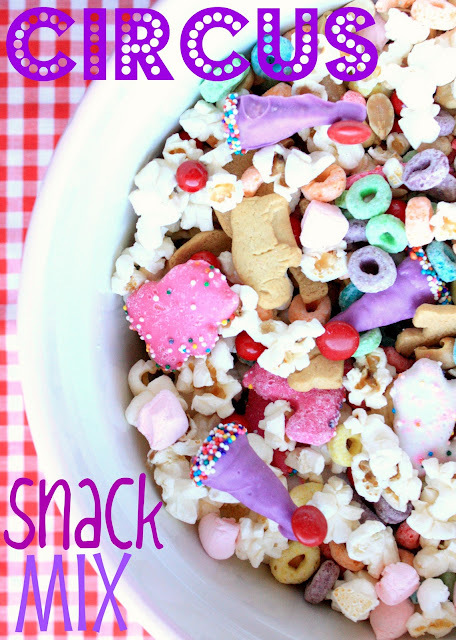 This fun, sweet & salty snack mix has been brewing in the recesses of my mind for quite awhile now. I finally got around to gathering the supplies for it... So, without further delay, "Ladies and gentlemen, boys and girls, children of all ages, let me direct your attention to this amazing circus snack mix!" 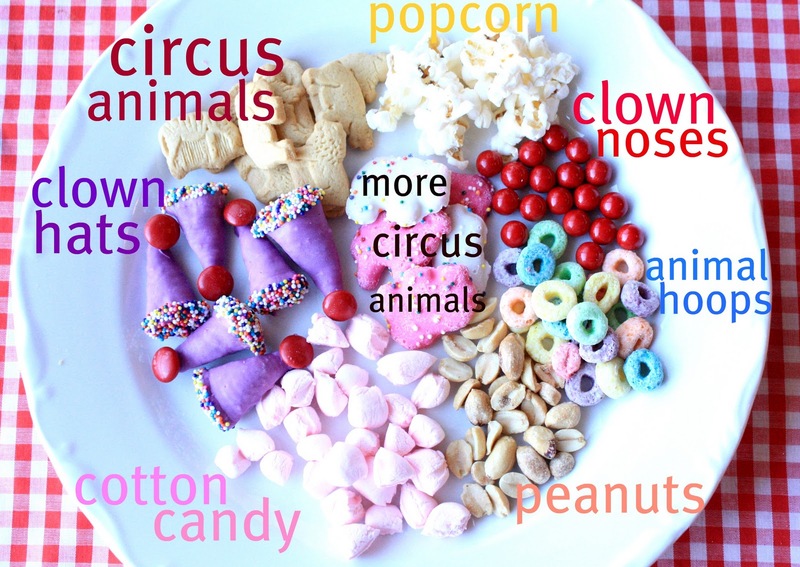 Mix all of these ingredients together and you end up with a big bowl of circus snack! Place a piece of wax paper on a work surface before you get started. Open the bugles and set aside the amount you will need for your clown hats (I made about 3 dozen) on the wax paper. Place some red m&m's in a bowl. Melt the candy melts as the package directs. Use a fork and dip each bugle in the purple melted chocolate one at a time, until completely covered. Place a red candy at the tip of the bugle while the purple chocolate is still wet. Place on wax paper to dry. Do this for each hat. Once they are all dry, re-melt the purple chocolate, dip the bottom rim of each little hat in it and then dip it directly in the sprinkles, or whatever you are using to decorate the rims. Set on wax paper to dry. 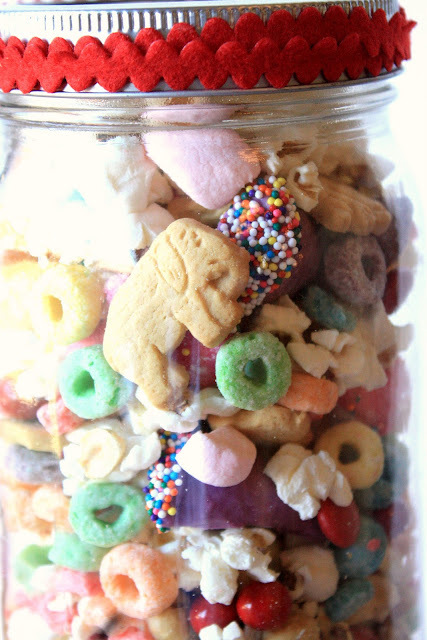 Serve this in snack bags at a party, school carnival or in the classroom. Simply use your favorite sugar cookie dough, roll it out, grab a small (1.5-inch) round cutter(I used a biscuit cutter) and cut out circles (clown noses). Insert popsicle sticks and bake the cookies. When cooled, ice them with red tinted royal icing. Optional: Sprinkle red sanding sugar on the icing while still wet. Let cookies dry completely. 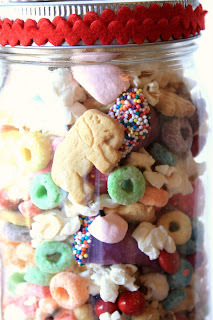 What a darling party favor this would make! Its perfectly acceptable that I practically jumped for joy like a toddler when I saw all of the circus chex mix - right? I love it all! >.< You're so original and creative. Love all that cuteness in one cute jar! This is so perfect! Who wouldn't love to munch on that?!?! Very cute! how adorable! love the clown nose too! This would be prefect for a circus theme party! You are so creative!!! Love this mix... so much fun! you are just such a fun grandmother, what a fabulous fabulous idea, every time those little hands grab their snack they get a big surprise. You are so creative Sue! Fun! That snack mix would go over well even with my oldest kids. It has everything everybody likes!! Such a fun idea. I wonder what a Super Bowl version would look like. What a fun snack! I love the clown hats. okay that is just too cute, I love the cookie pops too! I hope you are having a great new year Hugs! I made this with my kids today and we all had so much fun together! It's a bit time consuming, but worth it! It's such a cute treat, and tasty too! Thanks for the great idea!